Lehigh (1-7, 0-3 PL) takes on Bucknell (1-7, 1-2 PL) this week on "Heroes Day", where all first responders (military, fire, EMT, police) can pick up a game ticket free of charge at the Goodman Stadium Ticket Office. If you can't make it to the game, you can catch the contest on TV on the Stadium Network via these over-the-air networks or watch the feed of that broadcast online through the Patriot League Network. Matt Martucci, Ross Tucker and Marisa Pilla are the over-the-air broadcast team. We're in a period of time where the weather can't make up it's mind whether to be warm or cold. As it stands right now, the weather is supposed to be pretty good, with a morning rain clearing out well by gametime, where it will be a high of 54 to partly sunny skies. Aside from the football game, of course, Lehigh basketball has come up with something too for this weekend - an open practice that is free for everyone, from 11:00AM to 12:00AM. The men's hoops team is one of the preseason favorites in the Patriot League. Stop on in to check out the 2018-2019 Hawks. Sometimes, when I get down and out, I go all out with the food I create at home. When that happens, I don't care about health, staying trim, or anything like that - I dive into food headfirst and say, the hell with it, I'm going to make something I like. It is in that vein that I found Emeril Lagasse's Blue Cheese Stuffed Burgers. It's the type of week where you do take that extra step and combine the minced garlic, "Emeril Essence", a dash of sea salt and a generous grind of pepper and combine it with your hands. When you make that patty of blue cheese that you place in between two burger patties, you add that tiny dollup of sour cream or buttermilk to the Roquefort in order to make a smooth, creamy patty. When you put it on the grill, it's extra-high, getting a crust on the burger, and on the top rung you toast the buns - only the best baked whole wheat or brioche buns will do. Finish it with crisp lettuce and a huge slice of the last of the summer tomatoes, or even a nice Italian basil leaf, if you're daring. To me, something like this can really chase blues away. By definition, every "Drink of the Week" that I've posted this year (with the exception of Week One) has been a complete failure. That's because they've all resulted in losses. Clearly I need to go big in order to try to turn things around, and that's what I'm going to do, calling for the Mother of all drinks, the Bloody Mary, in an effort to turn things around. The perfect pair with the Bleu Cheese Burger, this isn't a time to get some stupid mix, it's time to go all out and do it right. Yes, that means grating your own horseradish. 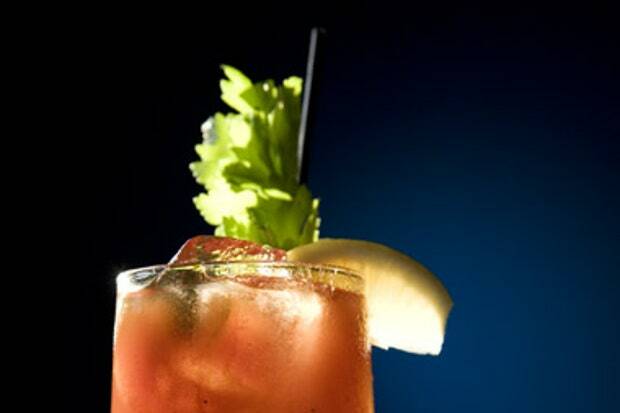 Put the tomato juice, vodka, Worcestershire, horseradish, Tabasco and pepper in a shaker and shake. Pour the mixture over ice, finish with lemon juice and garnish with the celery and lemon wedge. Eat the celery; it counts as negative calories while you're eating the burger.